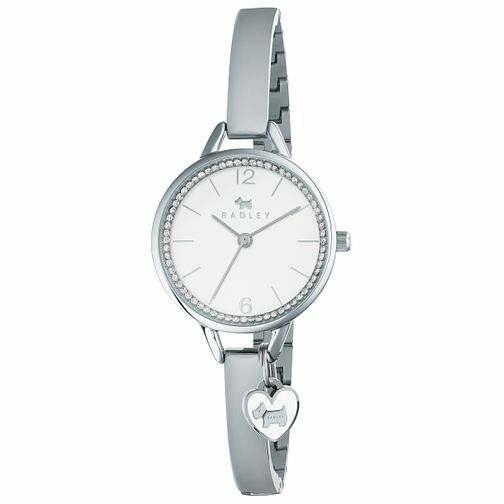 An utterly feminine semi bangle watch by British designer Radley. Styled in smooth stainless steel with a silver tone index dial that features a surround of glittering stones, and finished with an iconic Scottie dog charm. Radley Ladies' Stainless Steel Semi Bangle Watch is rated 5.0 out of 5 by 1. Rated 5 out of 5 by Anonymous from Great looking watch This was a last minute gift for my partner and I didn’t think I would get it in time but the guys at H SAMUEL said it would be fine and without paying any extra it cam in 3 days and it was in the sale and she loved it and was so happy on Christmas Day.